Cannabis Milk Chocolate Dipped Oreos: Starting with a classic oreo cookie dunked in cannabis infused milk chocolate, Deliciously fusing two perfect sweets together just like they fused 150 mgs of THC and CBD into each package. Having the THC will leave you well medicated while having the CBD to help keep the effects anxiety free!! 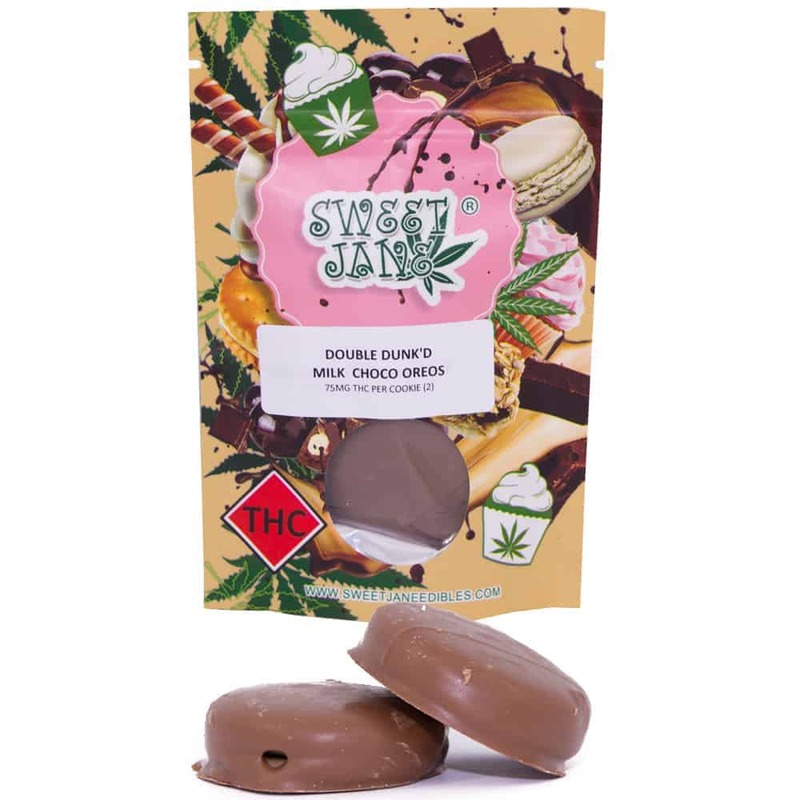 16 reviews for "Sweet Jane – Milk Chocolate Dipped Oreos – 150mg"
One of the best edibles I have tried! Super yummy and you definitely get a crazy body high from it. These were so good.. you can’t hardly tell it’s got THC in them. They work very well to relive stress and I found for cramps and pain very effective I would recommend this product to everyone! First real edible. Nice flavor and good results. Oh que c’est bon ça dans tout les termes imaginable excellent ! My new favourite snack when I want to unwind and feel a nice buzz. So tasty, stoney, and discrete! This Edible is very good and the packaging is Perfect! Would Definitely Recommend Grabbing at least a couple packs as you will want more. Excellent bon goût et un très bon effet je recommande!!! The taste is so good, it’s like you’re just having normal Oreos with the fun of the THC. Would definitely recommend and will purchase again! Excellent. These are really delicious. I only ate 1/4 of a cookie and i was good for the night. I’d definitely get these again. Effective. Love that there is also CBD. Very strong cannabis taste though which I’m not crazy about but most people don’t mind. Would recommend!